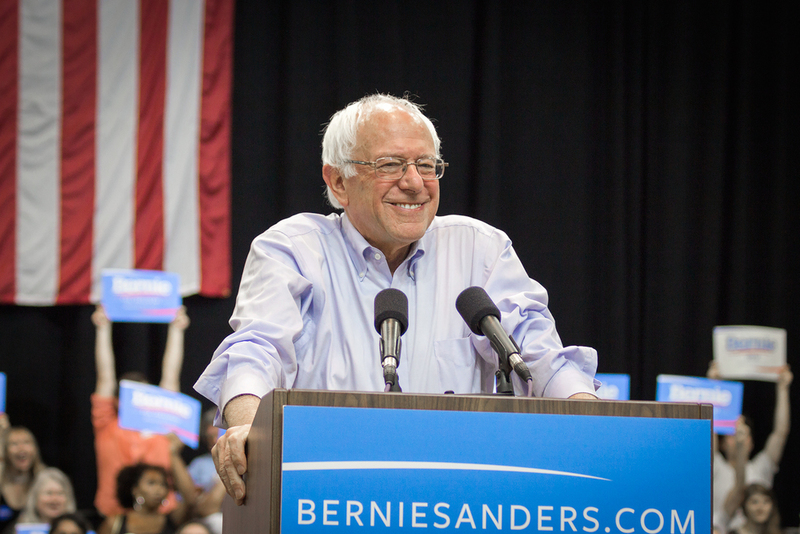 Bernie Sanders’ rhetoric on economic inequality is resonating so well that it has propelled him from long shot candidate to serious contender for the White House. His stump speeches are peppered with jabs at the “millionaires and billionaires” and he frequently cites the rampant inequality that is plaguing our country and made no better by Wall Street. However, it’s no secret that Sanders’ biggest obstacle to the nomination and subsequently the White House is shoring up support from Black voters. If he can take his powerful inequality message and expand it to seriously address the Black wealth and income gap, he may be able to diversify his base. It’s obvious why this type of messaging is so effectual; the United States is in an unprecedented era of economic inequality. According to the University of California at Berkeley economist Emmanuel Saez, the top one percent accrued 95 percent of total income growth between 2009 and 2012; the richest 400 individuals have more wealth than the bottom 150 million Americans. But, Bernie Sanders’ message hasn’t quite reached Black voters who, according to a national poll earlier this month, still favor Hillary Clinton by a large margin. As expected, Bernie Sanders performed well in the heavily white states of Iowa and New Hampshire, and although he did not win the Nevada caucuses, he earned 47 percent of the vote and 15 of the 35 delegates. However, Sanders was walloped in the South Carolina primary getting only 26 percent of the vote to Hillary Clinton’s 74 percent. According to exit polls, Clinton won 84 percent of the Black vote. Super Tuesday—which has a large concentration of Southern states—as well the remaining Southern primaries will be a big test for the Bernie Sanders’ campaign— most of the U.S. Black population lives in the region. If Sanders wants diverse voters in the South—and beyond—to hear his message, he should expand his message of inequality to include how race affects economic inequality. Inequality spares no race, but African Americans fare much worse. The negative effects of the Black wealth and income gaps are manifested in unemployment numbers, student debt, and the fight to raise the minimum wage—which all disproportionately affect the Black voters Sanders needs to win over in several upcoming primary elections. In Alabama, nearly 99 percent of income growth went to the top one percent; in Texas it was nearly 87. Arkansas stood at a hefty 84 percent, while Maryland came in at 81 percent. The numbers are slightly lower in Oklahoma with 70 percent, Tennessee at 69 percent and Georgia at 64 percent. Mississippi and Kentucky fared the best at 49 percent and 38 percent, respectively. When compared to the wage gap, employment numbers appear to look better on the surface. The overall unemployment rate was an even five percent at the end of 2015. However, among African Americans nationwide that number was a full 8.3 percent. Arkansas, Louisiana, Mississippi, Alabama, Georgia, South Carolina, and North Carolina all have Black unemployment rates at nine percent or higher. One of the main barriers to full employment is lack of access to education. Sanders’ call for tuition-free education resonated with millennials who have amassed more than one trillion dollars in student debt, but for Black students the problem is more pronounced. According to the Urban Institute, 42 percent of African Americans between the ages of 25 to 55 are saddled with student loan debt. Only 28 percent of whites in that age group can say the same. Even when Black students obtain a college degree, they still face obstacles to building wealth. While White families are able to rely on accumulated wealth in order to finance a college education, Black families are less likely to have the same resources. Thanks to racist policies in the post-Great Depression era, Black families were unable to acquire wealth like their white counterparts. One of the dominant ways to accrue wealth is through homeownership, but the Federal Housing Administration—created in 1934—regularly denied mortgages to black families and practiced redlining, where financial lenders would draw red lines around black neighborhoods they would not invest in. The legacy of these and other other racial policies is still felt today in the gap in wealth between White and Black households. Today, the median White household has 13 times as much wealth as Black households. According to the Urban Institute, the average wealth for a White family was $677,758 in 2013 while Black families had an average of just $95,351. These social ills, borne from our unequal economy, are problems that Bernie Sanders has been addressing on the campaign trail, just on a larger scale. After being criticized for not speaking out about racial issues, the Sanders campaign hired Symone Sanders (no relation), a young, Black woman, as the face of the campaign. He subsequently released platforms on racism, criminal justice reform, and police reform to prove that he had the chops to address structural racism. However, it’s clear that his economic platform isn’t addressing the racial component of inequality. Bernie Sanders should do more to demonstrate that he understands economic woes facing Black Americans. Racial inequality and economic inequality are not the same, but racism certainly plays a role in economic inequality. Changing his rhetoric to include the fact that Black Americans are disproportionately impacted by the wage gap, the student debt crisis, and all the rest can go a long way in proving that he wants to fight for Black voters as well.